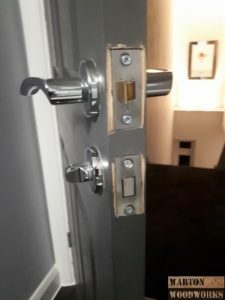 How to Fit a Door Handle to a New Door? Now you will need to mark the position where a hole will be drilled for your handle spindle bar (bar that connects both handles). 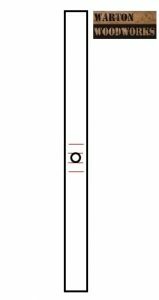 The diagram and image below show you where to mark the position of the hole, on the line drawn in the previous step. 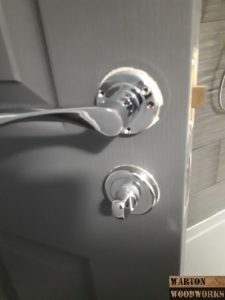 Hold up the latch against the door, so that the face plate is flush with the door edge. You then mark where the spindle hole in the latch intersects the horizontal line you drew. You should drill a pilot hole where you have made the markings in step 1. For such a task, you need a 2mm drill bit. Below is a diagram of a drilled pilot hole for the handle location. 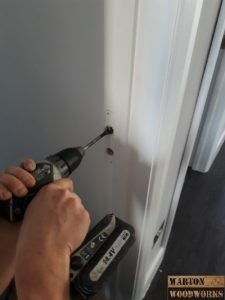 Now drill over this pilot hole using a larger diameter drill piece. 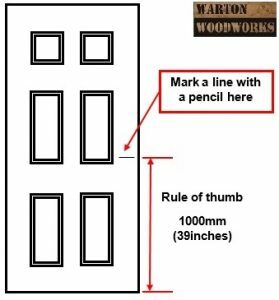 Your door handle instructions may tell you the exact size spade drill bit you need. It needs to be larger then your door handle spindle. When drilling, always keep the drill level to the ground. 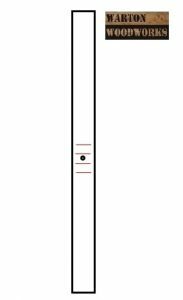 Below is a diagram of a larger hole drilled over the pilot hole. 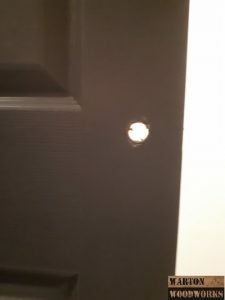 After you have drilled your hole, it should look similar to the image below. 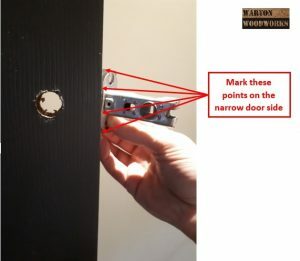 Once you have drilled the hole for your handles, you can now mark the location of your latch/lock. 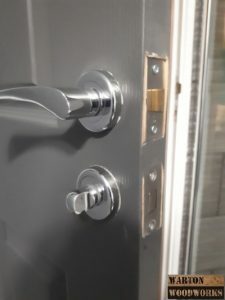 Simply place the latch/lock against the door, so the sliding latch part is inline with the door hole, as in the image below. You then need to mark the outer part of the latch, and the inner part. After you have marked the inner and outer parts of the latch/lock. Use a knife and cut along your marking lines. This creates a nice line for you to start chiseling. 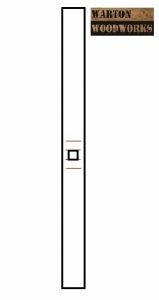 The red lines in the diagram below represent your marked, and knife cut lines. Mark the centre of these lines, and drill a 2mm pilot hole. Now drill over the pilot hole with a spade drill piece. 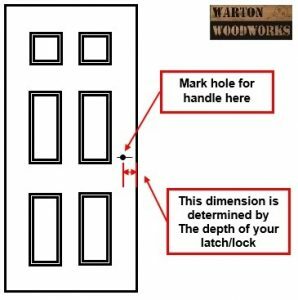 The diameter of the drill price should be 2mm more than the 2 inner latch/lock lines, in the diagram below. 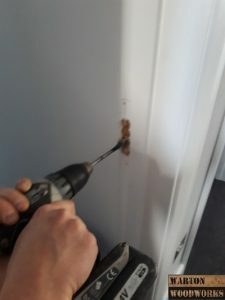 Drill through until you reach the handle spindle hole. 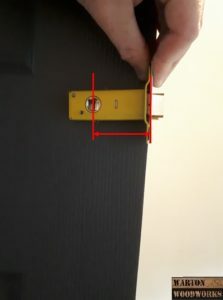 In order for your latch to slide in, the hole must be chiseled into a square. 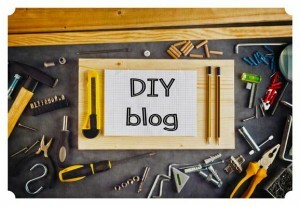 Make sure you use a long thin chisel for this part. 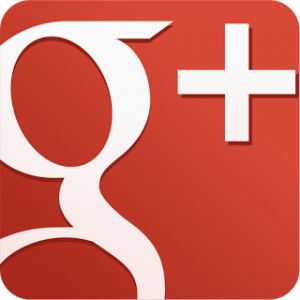 You should end up with a square hole (as in the diagram below). 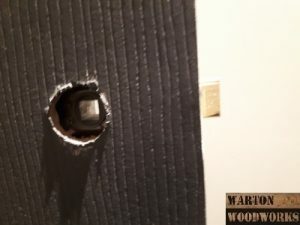 You should be able to see the handle spindle holes drilled previously through this hole. Now you will need to chisel away 1mm depth around this hole. Do this until you reach the outer markings, as in the diagram below. The reason you need to remove 1mm of material is so the latch/lock face plate will sit flush within the door side. 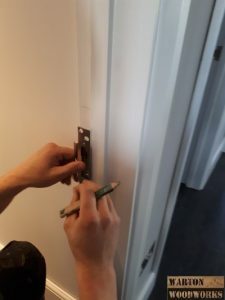 The chisels below are ideal when you need to fit a door handle to a new door. 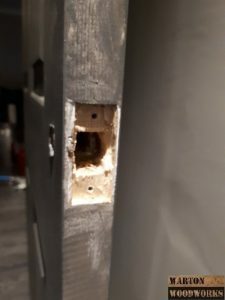 Once you have drilled a hole for your latch, and chiseled away 1mm of material for your face plate. 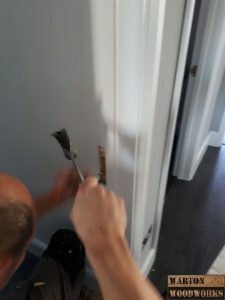 You can then slide your latch into the hole you drilled. 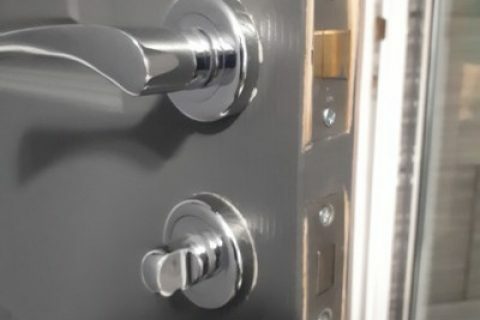 The square hole on your latch should line up with your door handle holes, as in the images below. 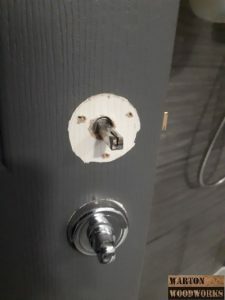 You can then screw the latch along with your face plate to your door, using screws provided. 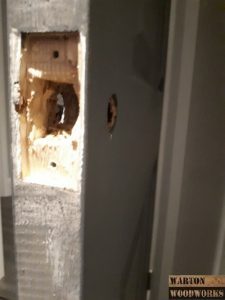 Now you need to fix the keep/striker plate to the door frame. 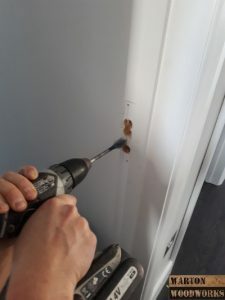 This involves making a hole in the door frame, so that the door latch/lock can slide into the hole. 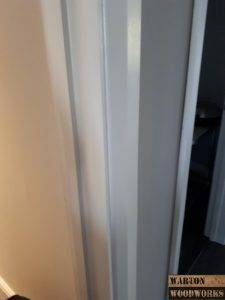 Place the keep/striker plate against the door frame, so that it lines up with the door face plate. Once in position, mark around the striker plate. 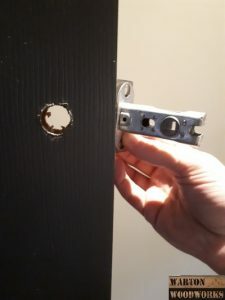 Ensure you mark the striker plate hole (where the door latch slides into place). 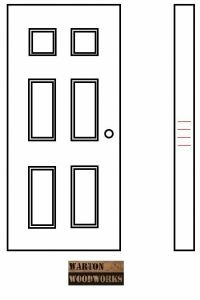 Remove the striker plate from the door, you should now see pencil markings. Use a sharp knife to cut along the pencil markings. 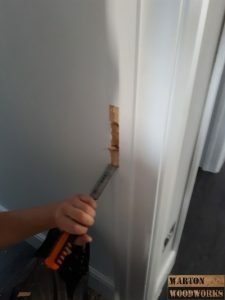 Use a spade drill bit to drill out the striker plate hole location. 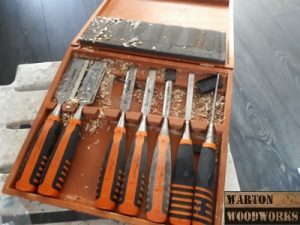 Use a chisel to remove 1mm of wood where the striker plate will sit. 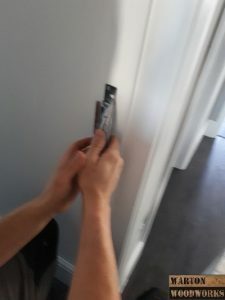 This ensures the striker plate will sit flush with the door frame edge. 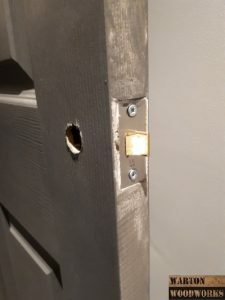 Once this has been done screw the striker plate to the door frame using the screws provided. 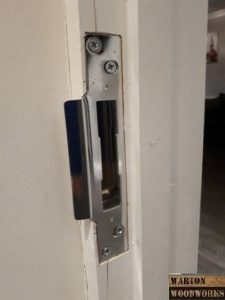 You should now be ready to fit a door handle to a new door. 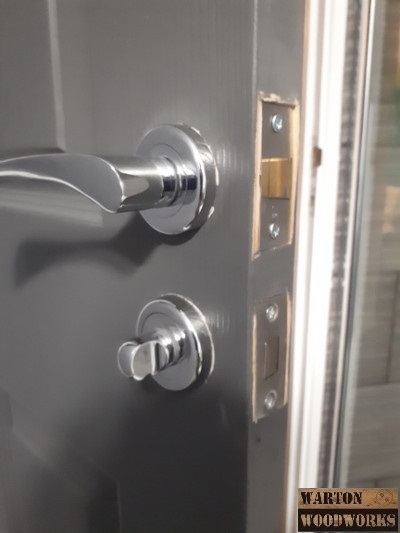 Screw a door handle to both sides of the door, but ensure the handle spindle bar is linking them together within your door. 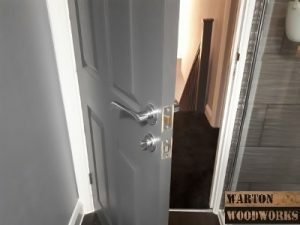 We hope you have enjoyed this guide on how to fit a door handle to a new door.